3herosoft PDF to Html Converter for Mac - The best PDF to Html Converter to convert PDF to Html on Mac. 3herosoft PDF to HTML Converter for Mac is one powerful and practical PDF solution program that specially designed by our technicists to help Mac users to convert PDF files to HTML web pages for easily making the PDF documents visible and fully searchable on Web. This PDF to HTML converter for Mac will convert PDF to the NET 2.0 standard HTML files and you doesn't need third PDF software to view such as Adobe Reader or Acrobat. This PDF to HTML Converter for Mac is an excellent PDF converter program and make it preserve the original initial formatting, bookmarks, images, vector graphics, fonts, alphabet characters and hyperlink, even automatically links page numbers to all extracted pages after PDF conversion. 3herosoft PDF to HTML Converter for Mac also sets necessary details for PDF converting, you can set some parameter to customize your PDF converting modes such as converting all PDF files, current page or scope pages. And it can keep high quality of converted HTML files same as the original PDF. Free download this PDF to HTML converter for Mac and get HTML files fast and quickly. 3herosoft PDF to Html Converter for Mac allows you to easily convert PDF files to HTML files on PC, you can edit and reuse the PDF files for building website or HTML captured directly. 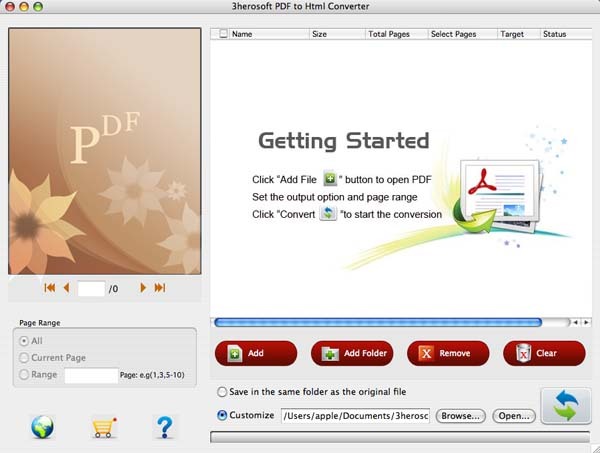 3herosoft PDF to Html Converter for Mac is a standalone program for PDF to Html. It does not need Adobe Acrobat or other third-party controls support. At times you need to convert only selected pages of your document. In this scenario, you don’t need to convert the complete document. 3herosoft PDF to Html Converter for Mac allows partial document conversion. Specify the pages or page range for conversion and the tool will convert the document accordingly. 3herosoft PDF to Html Converter for Mac can convert PDFs generated through any application into Html. This makes this tool quite versatile.